Find 12 holiday cookie recipes geared to make enough cookies to exchange with friends. Everyone takes home a variety of cookies and enough to share through the holidays. Invite up to 15 people so you ultimately have a total of 12 participants, including yourself. Chances are not everyone you invite will be able to attend and padding the invite list will help ensure your party is well-attended. Ask guests to bring at least six dozen homemade cookies to share. Each guest will ultimately take home six dozen cookies, six from each of the 12 recipes. 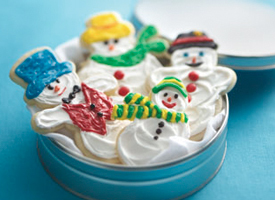 Extra cookies can be packaged with a little holiday flair and donated to a local community facility. Before guests arrive, prepare light snacks and festive drinks, such as cider, hot chocolate and eggnog. Fill your home with holiday music, décor and holiday-scented candles to set the mood. 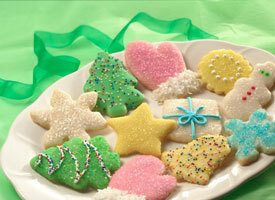 Place cookies in a designated area and ask guests to fill their holiday platter with six of each kind of cookie. Provide each guest with printed copies of the recipes to take home. Keep ‘em Separated: To maintain a cookie’s flavor and freshness, store different varieties in individual packets using Press’n Seal wrap. 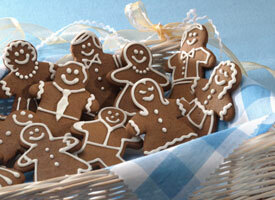 Sticky Situation: Prevent dough from sticking to cookie cutters by dipping the cutters in flour first. Safe Travels: Use Press’n Seal wrap to transport plates of cookies. The wrap seals to paper plates, glass platters - even wooden trays. Fill your cookie jar with a classic drop cookie that's doubly satisfying. 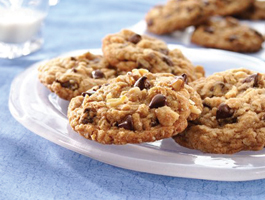 Chocolate lovers will love the chips, and whole-grain seekers will appreciate the natural oats. 1. Heat oven to 350°F. In large bowl, beat brown sugar, shortening, butter, cocoa, 1 tablespoon dry espresso, the vanilla and egg yolks with electric mixer on medium speed, or mix with spoon, until creamy. Stir in flour and salt. 2. Shape dough into 1-inch balls. Place about 2 inches apart on ungreased cookie sheet. Press thumb into center of each cookie to make indentation, but do not press all the way to the cookie sheet. 3. Bake 10 to 12 minutes or until edges are firm. Quickly remake indentations with end of wooden spoon if necessary. Immediately remove from cookie sheet to wire rack. Cool completely, about 30 minutes. 4. Meanwwhile, in 1-quart saucepan, heat whipping cream and 2 tablespoons dry espresso over medium heat, stirring occasionally, until steaming and espresso is dissolved. Remove from heat; stir in chocolate chips until melted. Stir in liqueur. Cool until thickened, about 10 minutes. 5. Spoon rounded 1/2 teaspoon filling into indentation in each cookie. Top each cookie with 1/4 teaspoon crushed candies. Mmm! Melt-in-your-mouth sugar cookies. Enjoy a classic! 1. In large bowl, beat 3 cups powdered sugar, the butter, vanilla, 1 teaspoon almond extract and eggs with electric mixer on medium speed, or mix with spoon. Stir in flour, baking soda and cream of tartar. Cover and refrigerate at least 2 hours. 2. Heat oven to 375°F. Lightly grease cookie sheet. Divide dough in half. On lightly floured surface, roll each half 1/8 inch thick. Cut into desired shapes with 3-inch cookie cutters. Place about 2 inches apart on cookie sheet. 3. Bake 5 to 7 minutes or until edges are light brown. Remove from cookie sheet to wire rack. Cool completely, about 30 minutes. 4. In small bowl, beat all glaze ingredients except food colors on low speed until smooth. Divide among several small bowls. Stir desired food color, one drop at a time, into each until desired color. Decorate cookies with glaze and other decorations as desired. Celebrate with rich and buttery melt-in-your-mouth cookies. You’ll find that one just isn’t enough! 1. Heat oven to 400°F. In large bowl, mix 1 cup powdered sugar, the butter and vanilla. Stir in flour, nuts and salt until dough holds together. 2. Shape dough into 1-inch balls. Place about 1 inch apart on ungreased cookie sheet. 3. Bake 10 to 12 minutes or until set but not brown. Roll in additional powdered sugar while warm. Cool completely on wire rack, about 30 minutes. Roll in powdered sugar again. Craving chocolate? 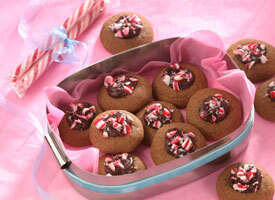 Indulge in triple-treat chocolate cookies. 1. Heat oven to 350°F. 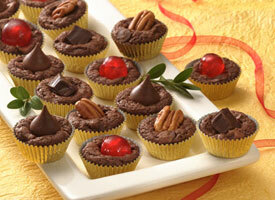 Place mini paper baking cups in mini muffin pan cups OR use mini foil muffin cups if you don’t have mini muffin pans. 2. In 2-quart saucepan, melt butter and chocolate over low heat 6 to 10 minutes, stirring occasionally, until smooth; cool 20 minutes. In large bowl, beat melted chocolate mixture, sugar, 1 cup of the flour, the cocoa, baking powder, salt and eggs with electric mixer on medium speed about 2 minutes, scraping bowl occasionally, until well blended. Stir in remaining 1/2 cup flour and the chocolate chips. Drop dough by rounded teaspoons into mini cups. 3. Bake 15 to 17 minutes or until edges are slightly firm (center will be slightly soft). Immediately top each with cherry, pecan half or chocolate, pressing slightly. Cool completely, about 1 hour. 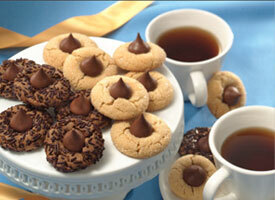 Watch for smiles and plenty of hugs when you pass a tray of favorite chocolate and peanut butter cookies. 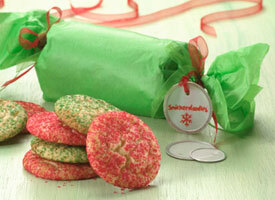 Red and green sugars dress up a best-loved cookie for the holidays. 1. Heat oven to 400ºF. In small bowl, mix red sugar and 1 1/2 teaspoons of the cinnamon; set aside. In another small bowl, mix green sugar and remaining 1 1/2 teaspoons cinnamon; set aside. 2. In large bowl, beat sugar, shortening, butter and eggs with electric mixer on medium speed, or mix with spoon. Stir in flour, cream of tartar, baking soda and salt. 3. Shape dough into 3/4-inch balls. Roll in sugar-cinnamon mixtures. Place about 2 inches apart on ungreased cookie sheet. 4. Bake 8 to 10 minutes or until centers are almost set. Cool 1 minute; remove from cookie sheet to wire rack. Cool completely, about 30 minutes. "Can we eat them yet?" is the first question you’ll hear when baking spicy gingerbread cookies. The aroma is almost as good as the taste! 1. In large bowl, stir together brown sugar, shortening, molasses and water. Stir in remaining cookie ingredients. Cover and refrigerate at least 2 hours. 2. Heat oven to 350°F. Lightly grease cookie sheet. On floured surface, roll dough 1/8 inch thick. Cut with floured gingerbread cutter or other favorite shaped cutter. Place about 2 inches apart on cookie sheet. 3. Bake 10 to 12 minutes or until no indentation remains when touched (for a softer, chewier cookie, bake 8 to 10 minutes). Remove from cookie sheet to wire rack. Cool completely, about 30 minutes. 4. In large bowl, stir together all frosting ingredients until smooth and spreadable. Decorate cookies with frosting. 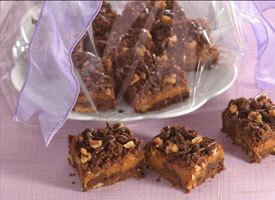 Chocolate, caramel and nuts create the classic turtle flavors that are anything but slow in leaving a serving tray. 2. Divide dough into 12 equal parts. Roll each part into 1/4-inch thick circle. (If dough is sticky, chill about 15 minutes.) Cut each circle into 6 wedges. Place wedges 1 inch apart on ungreased cookie sheet. Bake 8 to 10 minutes or until set. Immediately remove from cookie sheet to wire rack. Cool completely, about 30 minutes. 3. Meanwhile, in 1-quart saucepan, heat caramels over medium heat about 10 minutes, stirring frequently, until melted. In small microwavable bowl, microwave chocolate chips and shortening uncovered on High 1 to 3 minutes, stirring halfway through heating time, until melted and thin enough to drizzle. 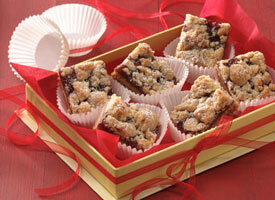 Indulge in rich bars that combine favorite caramel and chocolate flavors. 1. Heat oven to 350°F. Line 15x10x1-inch pan with foil, leaving about 2 inches of foil hanging over sides of pan. 2. In large bowl, stir together flour, brown sugar, cocoa and egg. Cut in 1 1/4 cups of the butter, using pastry blender (or pulling 2 table knives through ingredients in opposite directions), until crumbly. Stir in walnuts; reserve 3 cups of the crumb mixture. Press remaining mixture firmly in bottom of pan; sprinkle with 2 cups chocolate chips. Bake 15 minutes. 3. Meanwhile, in heavy 2-quart saucepan, melt caramels with sweetened condensed milk and remaining 1/4 cup butter over low heat, stirring constantly. Pour over crust. Top with reserved crumb mixture. Bake about 20 minutes longer or until bubbly. Cool completely, about 2 hours. 4. In small microwavable bowl, microwave 1 cup chocolate chips and the shortening uncovered on High 1 to 3 minutes, stirring halfway through heating time, until melted and thin enough to drizzle. Drizzle over bars. For bars, cut into 12 rows by 6 rows. 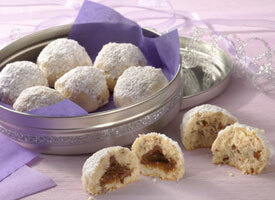 Delight in a sweet almond surprise baked in the center of frosted bonbons. 1. Heat oven to 375°F. In large bowl, beat all bonbon ingredients except almond paste with electric mixer on medium speed, or mix with spoon, until dough forms. 2. 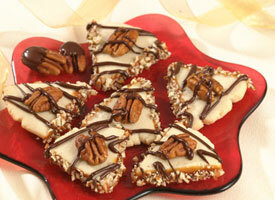 Cut almond paste into 1/4-inch slices; cut each slice into fourths. Shape 1-inch ball of dough around each piece of almond paste. Gently roll to form ball. Place about 1 inch apart on ungreased cookie sheet. 3. Bake 10 to 12 minutes or until set and bottom is golden brown. Remove from cookie sheet to wire rack. Cool completely, about 30 minutes. 4. For vanilla frosting, in small bowl, stir all Vanilla Bonbon Frosting ingredients until smooth. 5. For chocolate frosting, in small bowl, stir all Chocolate Bonbon Frosting ingredients until smooth. If necessary, stir in additional milk, 1 teaspoon at a time, until soft enough to spread. 6. 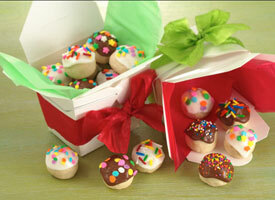 Dip tops of cookies into frostings and sprinkle with decors as desired. Three easy steps give you fruit-filled bars for a crowd! 2. Bake 15 to 20 minutes or until crust is golden brown. Spread with preserves. Sprinkle with reserved crumb mixture; press gently into preserves.